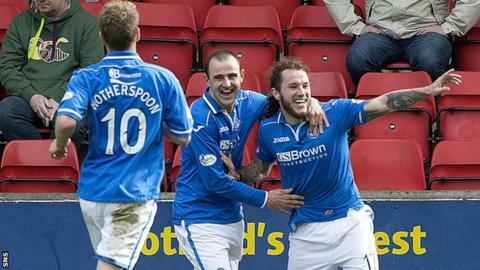 St Johnstone manager Tommy Wright was delighted with an extended unbeaten run following the defeat of Dundee United. However, Wright expects May's Scottish Cup final against the Tangerines to be "a totally different game". Steven Anderson and Stevie May were on target as Saints overcame United on league duty. "All it means for me is three points and to win a derby for the fans is important," Wright told BBC Radio Scotland. "We deserved the win. We played extremely well, started the game well and got a good goal from a set piece, hit the post twice and had a few scrambles. "I think we controlled large parts of the game and we're really pleased with the performance. "We knew that we had to start the game well and show a good attitude and we did that. "There is a confidence in the team and a belief in the team. We're on a good run at the minute. I think that's us unbeaten in five in league and cup games. We are particularly good at home." Saints have won the last three Tayside derbies against Jackie McNamara's side. "I hope that continues for one more this season," said Wright. "There's four more games to go. Players can go off form, players can get injured, formations might be different." And Wright was "really pleased" for his scorers Anderson and May. "Overall, we've had a really good day," added the Perth side's boss.